My name is Benita Nleya and I live in Hikwa Village, Zimbabwe. I'm grateful and thankful that there is going to be a Bible in our language of Kalanga soon. We have been struggling to interpret the Bible into Kalanga after it has been read in either English or Ndebele. When we have the Bible in our language, we will finally be able to understand it when we are reading, and also can teach the little ones who are fluent in Kalanga. So I'm grateful for this project. May it succeed, may God make it to succeed. As for me, the Word of God has helped me a lot because I was a sickly person but because of prayers and the knowledge of the Word of God it helped me a lot in my life. So I'm grateful that there will be a Kalanga Bible that will help me understand the Word of God even better, because all my life is dependent upon God and Him only. Thank you. Supplied by Piniel Tawanda Zimbizi. 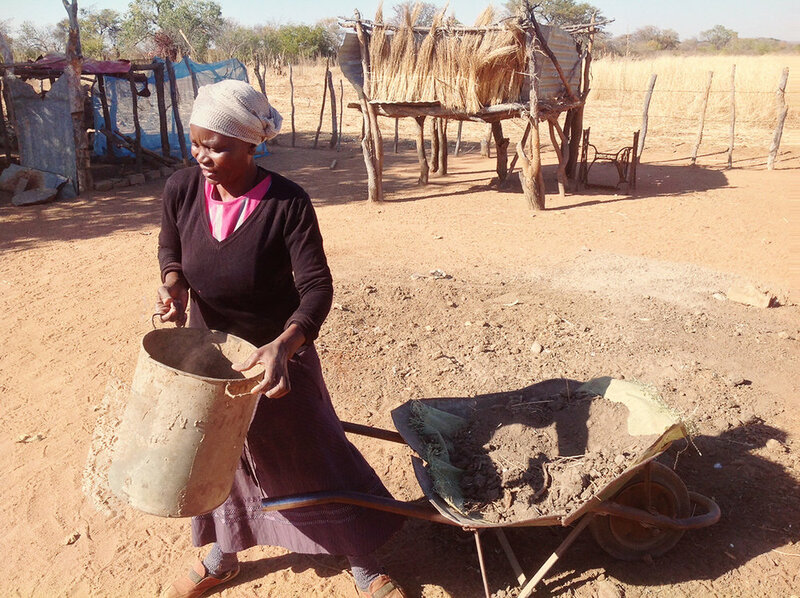 The Kalanga project is well underway and 30% of the New Testament has been translated so far. To contribute to the completion of the Kalanga Bible, click here. Supplied by Antoinette van der Meulen, who recently consulted on the Lambya translation project in Malawi. TWFTW has a huge need for consultants to keep up with the translators’ fast work! If you’re interested in this, please contact us. The bus-trip from Lilongwe to the far north of Malawi wasn’t for sissies. Once there, internet access was difficult, but otherwise staying in Chitipa and working with the Lambya team was very enjoyable. We got a move on with the Psalms, starting from Psalm 36 where we stopped last year. It’s usually the little words that cause the problems: an incorrect article, conjunction, adjective or prefix can completely change the meaning of a sentence. People are usually nervous about Psalm 119, but it was eventually not too difficult. One finds synonyms for words: law, the law, laws, commandments, instructions, teachings, commands, ways, and ordinances, and then one approaches the task as one would eat an elephant, “one bite (or verse) at a time”. And before we knew it, we had completed the Psalms. And before we knew it, we had completed the Psalm. It’s pleasant work; I particularly like the Psalms of praise. the Lambya translators could stay at home. supplied us with a free office as their contribution to the Bible that they will receive when the translation is complete. Training translators to translate the Bible into their own language is an enormous and critical part of what The Word for the World does, but the effects don’t stop there! Since people have been trained in the steps and procedures of translation, they are equipped to be able to translate anything. There are lots of educational pamphlets which people do not understand, but now they can translate them, for example information on medical concerns, agriculture, H.I.V, etc. Literacy programs have also been born in order to teach people how to read and write. This means the problem of illiteracy is in the process of being solved. Job creation, improvements in education, and overall community development are all positive results of empowering people to be able to translate text accurately, clearly, and naturally into their own language. Praise God! For more on our training program, visit twftw.org/training. Our International Director of Training, Dr. Regine Koroma, would love to hear from you! Provided by Rosemary Chimbiti, who is currently in her final year of the Diploma in Bible Translation with TWFTW. The above video was taken nearly 2 years ago when she had already begun working on the DBT. It has been a busy year for training in TWFTW, with some wonderful milestones! At a recent training event in Slovakia, an entire course was taught via Skype for the first time. The translator (unnamed due to sensitivity) who is working with a translation team in Slovakia to translate the Bible into Romani has been making use of Skype to help with the translation from Israel! For this event, this translator Skyped in to teach the students Introduction to Hebrew. Despite some challenges, it was a great success and TWFTW in Slovakia plans to conduct more training events like this in the future! 32 students also attended a training event in South Asia, where Introduction to Greek and Biblical Exegesis were taught. This included training on how to use the software program Paratext, and the students reported that they enjoyed the event immensely and feel that they learned a great deal that will help them to translate the Bible into their language more effectively. To learn more about TWFTW’s training programs, visit twftw.org/training! I'm Mrs Regine Masuku and I live in Dombodema with my husband, Peter Masuku. I'm joyful to hear that the Bible will now be translated into our language of Kalanga. We normally use English or Ndebele Bibles, but it is so difficult because there are elderly people here who do not understand English. So I find this translation to be a good work that has been planned. We ask and desire that God may bless us with this and we also thank the person who came up with this idea, because this person has remembered us. May he also give us wise people who are fully equipped who will make it possible for this Bible to be produced. Let us unite as Kalanga people and see that our Bible is produced, because if we don't have our own Bible, it's like we are lost. It is said that a child who does not cry will die of hunger, so let's cry together, crying as we act, as we work, and as we help each other. Story and photo provided by Piniel Zimbizi. One of the villages in Tanzania that speak the Matengo language is called Litembo. The Word for the World translators have already completed about 44% of the translation of the Matengo New Testament! In the village of Litembo, there is a group of villagers who meet together for fellowship every Saturday to pray and read the Book of Mark, which has been translated into the Matengo language. The group testifies that their fellowship has been excellent and began when the village leader encouraged them to gather and read the scriptures together. They are very thankful that the Bible is being translated into the Matengo language and they pray for God to make it possible for the whole Bible to be translated. One young man has even begun preaching the Gospel to people in nearby villages using the translated Gospel of Mark! They are thankful for what has already been translated, and to all people who support this work of God! Thank you for helping us to bring people the Word of God to them in their heart language. To get involved, visit twtftw.org/give. 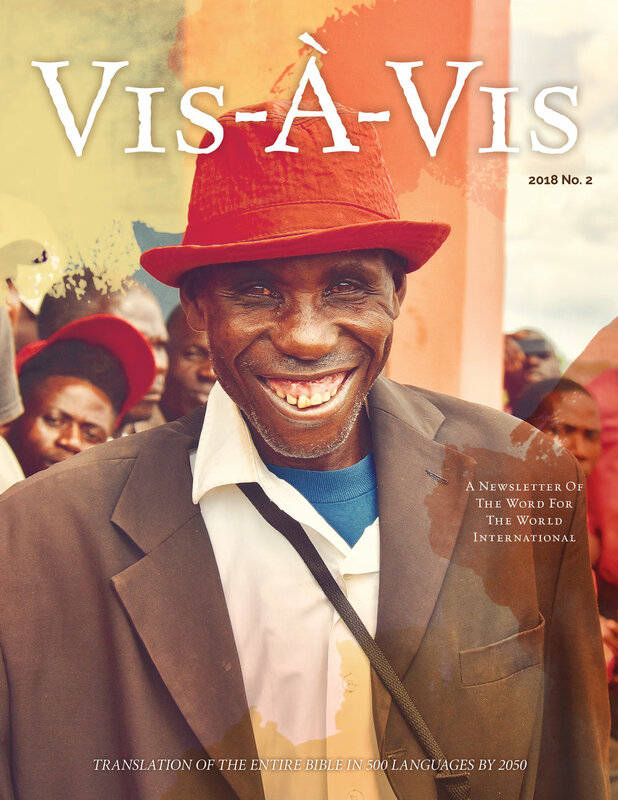 Read our latest Vis-À-Vis newsletter! My name is Phaphama Sibanda and I am married to Mr K. Ncube, who is a pastor. I live in Tjompani in Dombodema, in Zambia. When I heard that there is a project going on to translate the Bible into our language of Kalanga, I was very, very happy! We have been facing challenges because when we are reading the Ndebele Bible, which is the one we have access to at the moment, some of us don't understand the language, even in preaching. So when we read the Kalanga Bible in the future, we will be able to preach effectively. We are not able to understand because some of the Ndebele words and it makes it difficult to preach what we don’t understand. We are very happy and we also ask God to help the translators and give them strength so that it may be a success. The Bible leads us and guides us in all things that pertain to life. We ask that God would give the translators strength and wisdom and that the project will be a success, in the name of Jesus Christ! Language plays an integral part in our lives, to an extent that we sometimes aren’t aware of, especially when we speak a widespread language such as English or French. Our world caters to our linguistic needs and we don’t think about what it must be like to not fully understand what we hear or read. Our identities, linguistically and otherwise, are respected and provided for. When we go to church, we are spoken to in our first language. When we read the Bible, we read it in our first language. What if you are a Meqa speaker in Ethiopia, with only 1% of the entire Bible (3% of the New Testament) translated, and not even printed yet? Or a Matengo speaker, with only 10% of the Bible (44% of the New Testament) translated? Think of the nuanced complexities of the Word of God – and now imagine having to read it in a second, third, fourth, or even fifth language. Imagine feeling like God does not speak your language – does not understand that very crucial, underlying aspect of your identity and your culture. That is what we seek to change. To learn more and get involved, start here. The Word of God brings freedom! Victor Muhando, a man from the Zigua-speaking village of Kwediboma in Tanzania, was saved from alcoholism and his smoking addiction when he read the Bible in his own language and encountered God for the first time. He first received scripture in Zigua in 2015, and when he started reading it, he was drunk and ill with liver and skin diseases because of his drinking. He was touched in his heart after reading that God has a good plan for eternal life for every human who accepts Him. He went straight to the church where he was led in a prayer of repentance. He began going to church every Sunday and reading the Word of God, and was inspired to change his life and become healthy again. Now, two years later, he is still regularly attending church and says that he likes to serve God by using his language to speak to his own people about the Lord. Praise God for freedom and victory in Christ! Story and photos supplied by George Chombo.